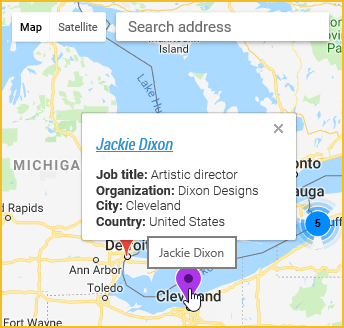 Using the members location mapping gadget, you can display an interactive map that shows where your members are located, and displays information about each member. The process of setting up a members map involves setting up Google Maps integration, inserting a members location mapping gadget, then adjusting the members location mapping gadget settings. For ideas and examples of ways to use this gadget, take a look at this blog post. To display member information in a table format, rather than on a map, you can insert a member directory gadget. A Google billing account is required to access the Google APIs used by the members location mapping gadget. 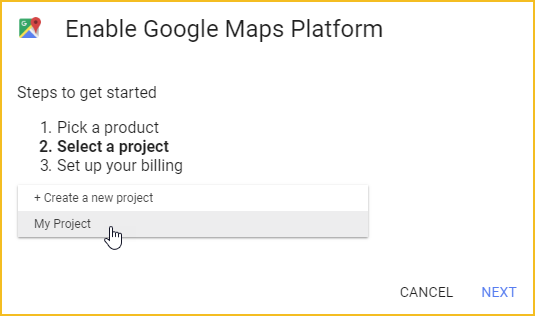 Depending on the number of times your member map is viewed, Google may charge the credit card associated with your Google account. For each Google billing account, a credit of $200 USD is automatically applied. 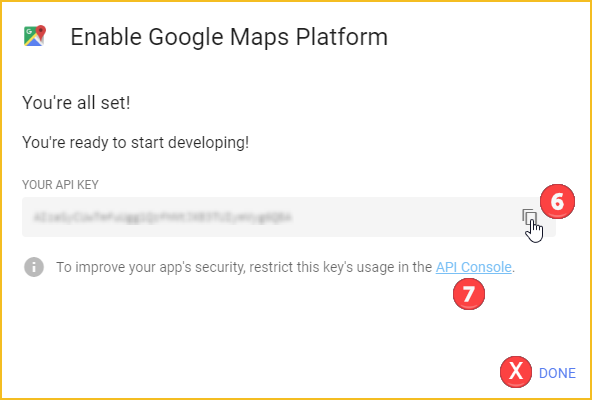 In other words, the first $200 of Google Maps API usage is free. Charges are approximately half a cent per transaction, so you'd need about 40,000 map requests before you use up your $200 credit and start getting billed. To avoid any charges beyond the credit limit, you can set your own API limits and alerts. Wild Apricot does not charge anything for access to Google's Maps APIs. Any charges that you incur will be billed by Google to your Google billing account. For more information on Google API billing, click here. Before you can add the members location mapping gadget to a page on your site, you need to set up your Google Maps integration. Go to the Google Maps platform and click the Get Started button. 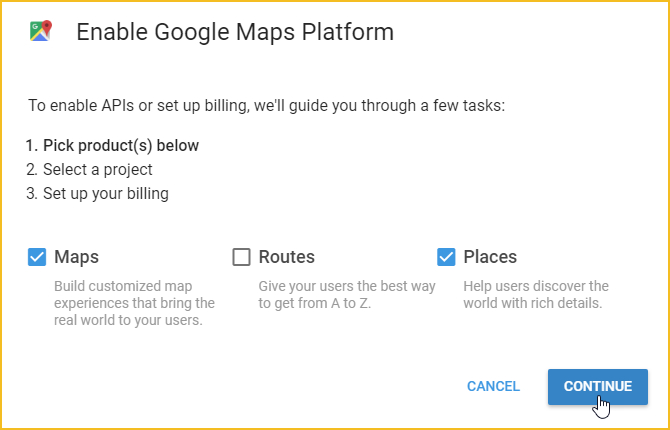 On the Enable Google Maps Platform screen that appears, check the Maps and Places checkboxes then click Continue. Select or create a project then click Next. Enable billing for your project, if it is not already enabled. If you are not logged in as an administrator of a Google billing account, you may need to create a Google billing account or contact your Google account administrator and ask them to enable billing for your Google account. For more information on Google billing accounts, click here. 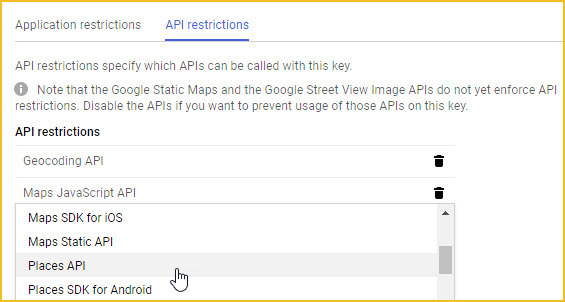 Once you are logged in an administrator of a Google billing account, you are prompted to enable your Google Maps APIs and generate an API key. Click Next to do so. From the next screen, copy the API key and save it somewhere. You'll need to paste it later in the field provided within your members location mapping gadget settings. Do not click the Done button on this screen. On this same screen where you copied the API key, click the API Console link. Scroll down to the Application restrictions section and select the option to restrict this key's usage to HTTP referrers (websites). Enter all your Wild Apricot domain name(s) in the fields provided under Accept requests from these HTTP referrers (websites). You can enter the http or https version of your domain name, or both, with or without the www. Do not use the wildcard *.wildapricot.org. If you are using a custom domain name and want to see the map in admin view, add your wildapricot.org domain as well. Click the API restrictions tab. 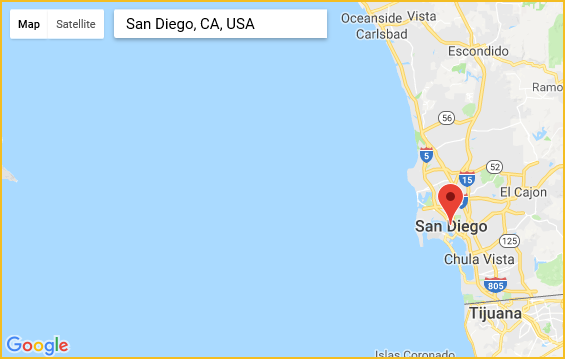 Now that your Google maps integration is set up, you can add the members location mapping gadget to a page on your Wild Apricot site. Within the gadget settings, be sure to paste the API key you copied above. It may take up to 5 minutes for your settings to take effect. Go to Sites pages (under the Website menu) and create or begin editing the site page where you want the members map to appear. Drag the members location mapping gadget from the list, and drop it where you want it to appear on the page. You can insert it into a section within a layout, or above or below a layout. Within the gadget settings on the left, you need to paste the API key you copied above, then choose which members you want to display, choose the address field(s) that determine the location of your members, and decide which fields to display in the pop-up window for each member. For more information, see Gadget settings (below). To complete the set up of your members location mapping gadget, you need to adjusts its gadget settings. Within the gadget settings, you need to paste the API key you copied above, then choose which members you want to display, choose the address field(s) that determine the location of your members, and decide which fields to display in the pop-up window for each member. There are also other optional settings you can adjust. To display the settings for a gadget, hover over the gadget then click the Settings icon. The following settings are available for members location mapping gadgets. Include all members with a membership status of Active or Pending Renewal. Use a saved member search to limit members to those that match the saved search criteria. When you choose this option, you can choose from a list of your saved member searches. This option will only appear if you have a saved member search. Restrict the map to members at selected membership levels. When you click this option, you can choose one or more membership levels. If you check the All levels option then all levels – including any levels added in the future – will be selected. Restrict the map to members belonging to selected member groups. When you click this option, you can choose one or more member groups. If you check the All groups option then all groups – including any groups added in the future – will be selected. Indicates whether to include only bundle administrators and exclude individual members of bundles. To specify the location of your members, you can choose one or more address fields from your common fields and membership fields. At the very least, you need to choose one field that includes the country name. Make sure you only select geographic address fields (e.g. Address, State/Province, Country, Postal/Zip code). Selecting other types of fields may prevent your map from being displayed. Don't choose admin only fields, or fields with access or privacy settings set to No access, and make sure that the members you chose to include are permitted to access the selected address field(s). All common and membership fields are available for selection except system fields (such as first name, last name, email, phone, and organization), admin only fields, internal use fields, password fields, and fields that use the following field types: picture, date, extra charges, and rules and terms. You can choose up to 5 common or membership fields to be displayed in the pop-up window that appears for a member when you click their marker within the map. The first field you choose will be used as a link to each member's public profile. You can specify the height of the map in pixels. If you specify a gadget title, the title will appear specially formatted within the gadget. Depending on the gadget style you choose, the title may appear in a heading box. If you want to add a description under the title, do not enter a gadget title, but instead, create a content gadget with a title and description, and place the content gadget ahead of this gadget. The gadget style determines the physical appearance of the gadget. The style you choose will determine the color and format of the gadget title, the gadget content, and the gadget border. You can choose from theme-specific styles and styles that are common to all themes. While the gadget is loading the location information for your members, a notice will appear indicating its progress. To refresh the gadget so that all processed markers are displayed, visitors can click the refresh icon within the notice. 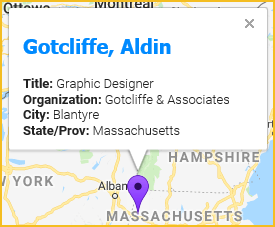 When visitors to your site first view your map, the map is zoomed out to display all markers. Markers indicate the location of individual members. Multiple markers that appear in the same general area are represented by numbers that indicate the number of markers clustered together. Visitors can click the number to zoom into that area. They can also enter a city, address, or postal code to jump to the specified location. Visitors can click any of the markers to view a pop-up window displaying the member information you selected within the gadget settings. They can also click the member's name to view the member's profile and send the member a message. To avoid excessive charges for API usage, you can set your own smaller limits. Setting your own limits also protects you from someone stealing your API key and running up charges against your Google account. Wild Apricot is not responsible for the security of your Google Maps API key or for any charges to your Google billing account. For instructions on setting API access limits, click here. These are used to retrieve the geolocation for each contact. This is performed once for each contact and doesn't depend on the number of times the map is displayed. Alternatively, you can set this to the number of members in your association. This is used at least once when a visitor enters a search string in the map's search field. The total impact of these settings is a maximum charge of $92 a day, minus the $200 a month credit. You can also set up alerts so that you are notified when your account charges reach a certain limit. You might want to set a limit of $200, since that's the amount of the free credit you receive each month. For instructions on setting billing alerts, click here. 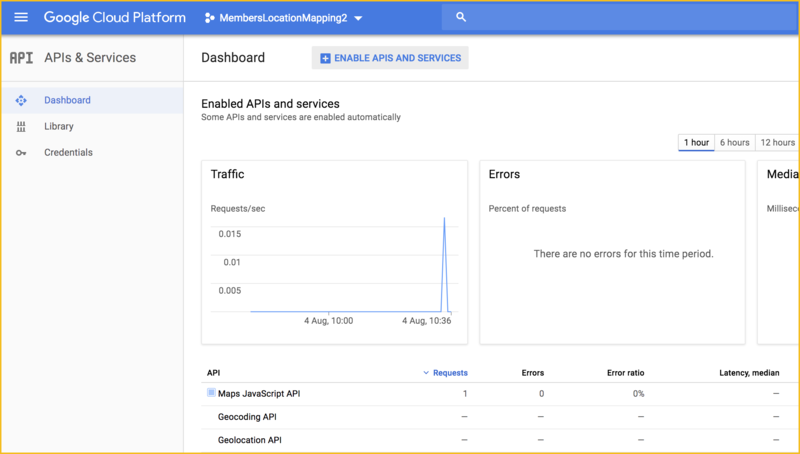 You can monitor and manage your Geocoding API request limits from the Dashboard on your Google Cloud Platform Console. For more information, see Google Cloud Billing Documentation. Check their membership status. Only members with a membership status of Active or Pending Renewal can be displayed. Check their privacy settings for your location fields. If they are set to No access, then that member will not be displayed. Remember, it may take up to 5 minutes for your changes to take effect. Check that you entered the URL correctly in the HTTP referrers section when setting up your Google Maps integration.